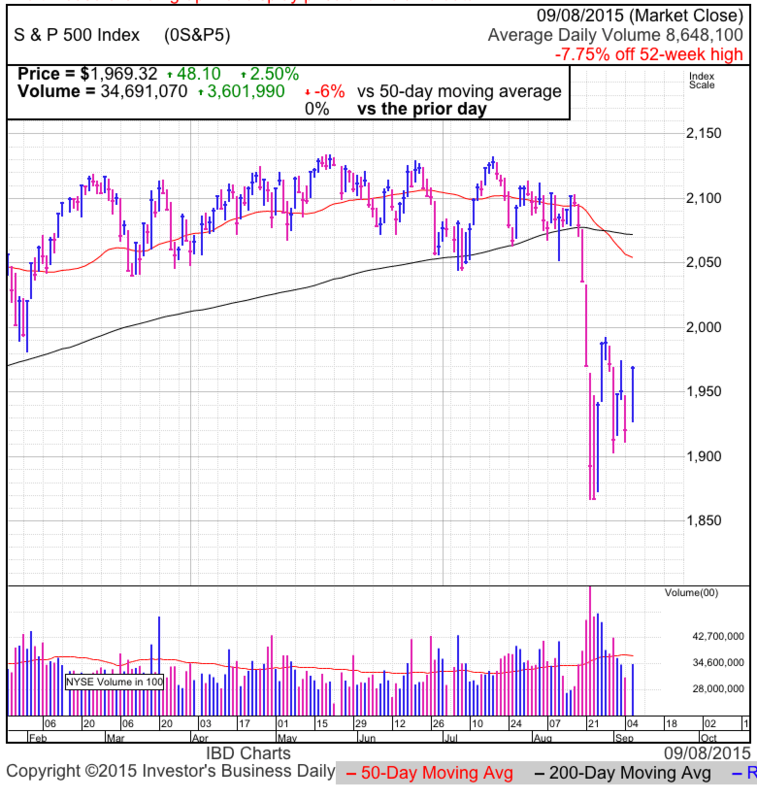 The S&P500 rebounded sharply, rocketing past 1,900 on the last day of the third quarter. Volume was above average, but suspiciously light given the size of today’s move and the traditional end of quarter repositioning. It would be great if there was a solid reason behind these gains that we could build a sustainable rally on. Unfortunately this was another example of the U.S. markets taking their cues from overseas traders. Strong gains in Asia and Europe early Wednesday morning lead to our gap higher at the open. While there are plenty of reasons to believe in the U.S. economy, linking our stocks to overseas economies is not healthy. Few believe China and Germany are done falling into their respective holes and if we continue pricing US equities based on how foreign markets trade, today’s rebound will be undone in a matter of days. The most important thing we need to see is our markets decouple from the rest of the world. Normalcy will return when we start trading on traditional metrics like earnings, revenues, employment, and GDP. There is a good chance this will happen over coming weeks as US employment and third quarter earnings season diverts our attention from how the DAX or Shanghai traded overnight. The first sign the correlation is breaking down will be the end of these wild one and two percent gap openings. Next will be more days where our trade bears little resemblance to the moves in Asia and Europe. No one payed much attention to foreign markets a couple of months ago and it is only time before traders stop looking at their terminals in the middle of the night before deciding to buy or sell US equities. Without a doubt overseas weakness is a headwind, but a 10%+ correction has done a good job pricing it in. Europe and Asia have been slowing for a while and if they posed a serous threat to our economy, it would have shown up in our numbers already. Resilient third quarter earnings will prove that fears of overseas economies dragging us down are unfounded. When that happens, it will kick off our year-end rally as international traders move their money to the most attractive economy on an ugly block. In the meantime, expect elevated volatility as long as our markets remain linked to overseas trade. What’s a good trade worth to you? How about avoiding a loss? For less than the cost of a daily coffee, have analysis like this delivered to your inbox every day during market hours. As an added bonus, I also share my personal trades with subscribers in real-time. Start your free trial today! The S&P500 fell out of bed Thursday morning, dragged down by German markets that are still coming to terms with the Volkswagen emissions scandal. This is just another example of how our stock market is fixated on global-macro trends instead of the more traditional domestic and company specific data. But in an impressive midday reversal, the S&P500 found its footing near 1,910 support and erased most of the early losses. This intraday change in direction looks similar, but in the opposite direction as last Thursday’s “no hike” fizzle that kicked off this week-long, 100-point selloff. 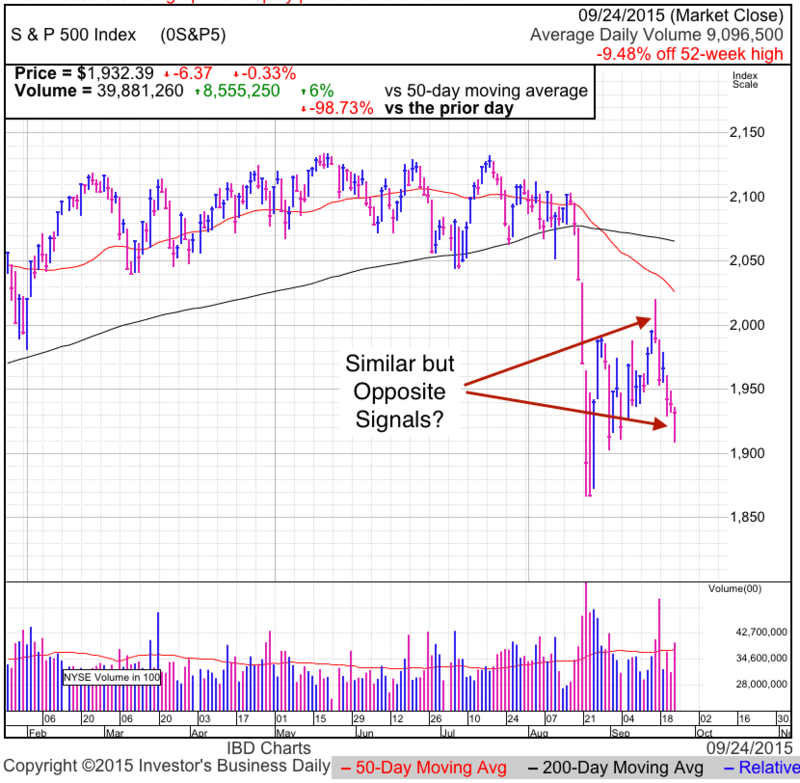 Could this price-action signal a dramatic change in direction just like it did last week? The first thing to cross off the list of stuff to worry about is this Volkswagen emission scandal. While this will destroy a historic level of auto industry shareholder wealth through recalls and government fines, this is a very company specific story. This didn’t expose a weaker than expected economy or consumer, so it won’t have a lasting impact on future earnings for the broader market. The relevant stocks will take a beating to reflect the staggering loss of shareholder wealth, but then everyone moves on. 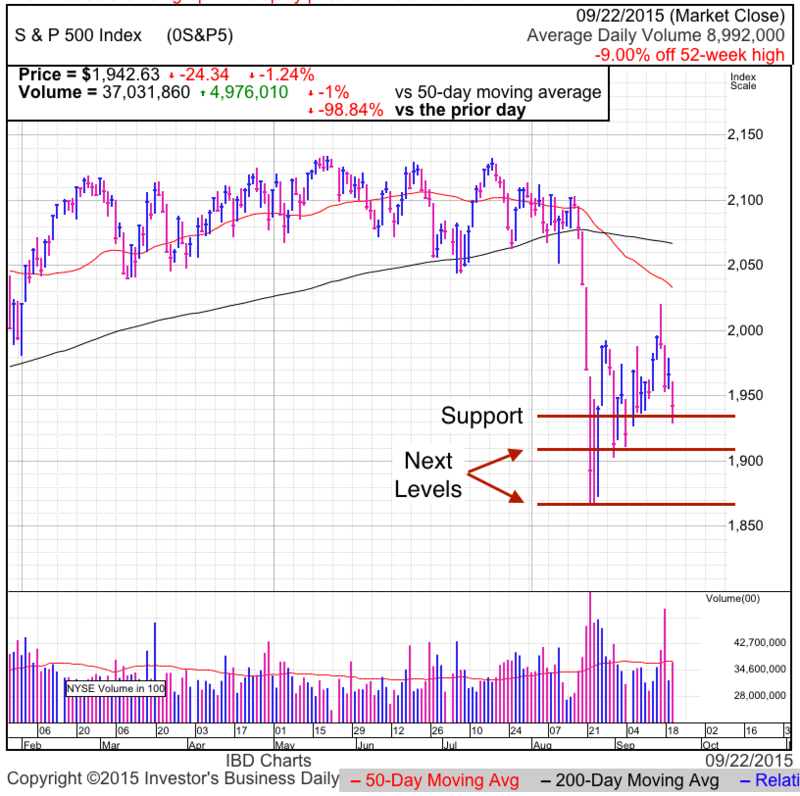 Last week we stalled above 2,000 because few buyers were willing to chase prices higher. But 100-points lower, the value proposition is dramatically different. On Thursday, value buyers were finding deals they couldn’t refuse and owners were unwilling to discount their stocks any further. Elevated demand and tightening supply put a floor under the market and kept the selling from spiraling out of control. Most likely this bounce will push us up to 1,950 support/resistance. From there it is anyone’s guess as to what happens next. But the great thing is no one is forcing us to pick sides right now. Instead we can wait for the market to show its hand before we decide which way to trade this move. Stall and stumble? That means August’s 1,860 lows are the next stop as we dig out a double bottom. On the other hand, if fear evaporates and the recent dip priced in the inevitable rate hike, then we could continue higher and this slip is simply a higher-low on our way up. The key is how traders respond to 1,950. Do they buy the strength? Or do they sell before the inevitable fall? While I cannot tell you right now what will happen, the market will let us know soon enough. The Fed decided to keep rates near zero, citing global economic uncertainty and low domestic inflation as their justifications. This lead to dramatic volatility and the S&P500 traversed nearly 100-points intraday as it tried to figure out what all of this meant. The initial dip gave way to a huge surge higher, but we were unable to hold those gains and closed near the day’s lows. It is hard to find anything encouraging about Thursday’s price-action. We got the “good” news people were hoping for, but it failed launch a sustainable move higher. No doubt the previous five-day rally priced in a big chunk the “no hike” pop, turning this into a “buy the rumor, sell the news” trade. That’s what happened intraday and we will see if the fizzle continues Friday. 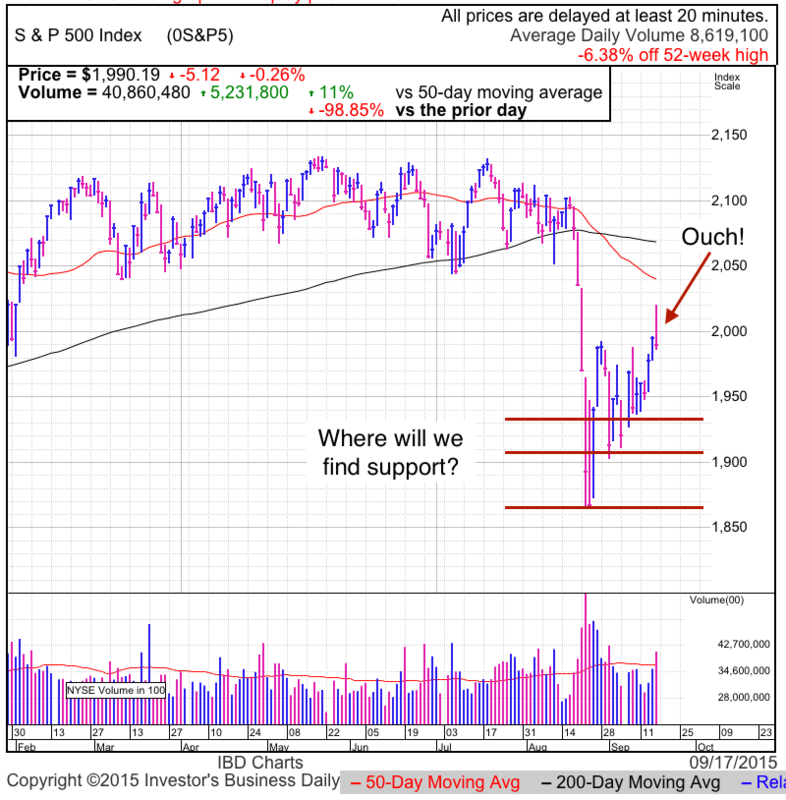 This week’s rally pushed us to the upper end of the recent 1,900-2,000 trading range. The post-Fed pop launched us well above 2,000 resistance, but it didn’t take long for the breakout buying to stall and we tumbled back under 2,000. It seems few were willing to chase prices higher and that lack of demand could be a huge obstacle in coming days. This left us with an ugly intraday reversal on the chart that stands out like a sore thumb. Thursday’s pathetic close could easily make prospective buyers take a step back as they wait to see what happens. If enough people pause and asses, it becomes a self-fulfilling prophecy as prices continue tumbling on weak demand. This downward spiral will continue until it reaches levels so low that dip-buyers can no longer resist the temptation. Since we are near the upper end of the recent consolidation, we have a ways to fall before we will reach those irresistible levels. While people were relieved the Fed didn’t do anything to threaten the fragile global economy, that relief could very easily turn into anxiety because the global economy is so fragile the Fed worried it might not be able to handle a nominal 0.25% interest rate hike. While the medicine tastes great, maybe we should be worried about why we need it. Between the weak technicals and renewed worries over global growth, we could easily see the market slip back to 1,900 support. If this dip reignites the emotional selling, we could easily undercut last month’s 1,860 lows. In the near-term we should be prepared for more volatility and weakness, but this is most likely giving us another opportunity to buy stock closer to recent lows. We need to undercut 1,860 to form a double-bottom and while that will feel scary, it will be another great chance to buy stocks even cheaper. It was another strong day for the S&P500 as we closed at the highest levels since the August correction began. As worried as people have been, we’re up four out of the last five days and that lone down day was only a modest eight point decline. Without a doubt buyers are growing increasingly confident. Is this sustainable, or the highs before we tumble back into the trading range? It is hard to get away from the Fed’s rate hike since that is the only thing people are talking about. Will they hike or won’t they hike, that is the question on everyone’s mind. As a contrarian, I like to trade against the crowd, but opinion is divided on this issue. Without a consensus to trade against, it is hard to figure out what comes next. Even if I knew ahead of time what the Fed was going to do, it wouldn’t do me any good because I cannot begin to guess how the market will respond. That’s because with such a divided opinion, it is hard to figure out who has been buying these last couple of weeks. Is this a short-squeeze? Or have we finally run out of fearful sellers and are rebounding on the resulting tight supply? Maybe those that are hopeful the Fed will keep rates artificially low are buying ahead of that expected announcement? Or are people are buying for no other reason than other people are buying? Without a popular opinion driving this move, it is hard to figure out what is behind it. But all is not lost. While we might not know what the market is thinking right now, it will show us its hand following the Fed’s decision. There are four possible outcomes and four ways to trade it. This is a bullish signal because it tells us the market no longer cares about China or rate hikes. Everyone who fears these things sold weeks ago and when there is no one left to sell a headline, it stops mattering. Over the medium-term this is a bullish outcome because the rate-hike debate and uncertainty is finally over. While the knee-jerk reaction was to sell the news, a 0.25% bump in short-term interest rates will not have a material impact on our economy. There will be plenty of value oriented buyers ready to jump in and snap up discount shares from fearful sellers. While we could slip to the lower end of the trading range, even undercutting the 1,860 lows, the Fed hiking rates tells us they believe in this economy and so should we. This is most likely a temporary relief rally that will fizzle. Delaying the rate hike by six or twelve weeks isn’t going to make much of a difference and isn’t something to get excited about. In fact, I would be concerned about the Fed not hiking rates because it tells us they think our economy and stock market are too fragile to handle such a nominal rate hike. If they’re worried, then we should be too. A bloodbath following good news will be our signal to stay clear of this market. If the Fed doesn’t believe in this market, we could smash through the lows. The situation is further compounded because the cloud of rate hike uncertainty continues indefinitely. The market can handle bad news because it is quantifiable. This not knowing is what drives it crazy. While it is hard to read the market ahead of time, the way it responds to the Fed’s decision will tell us a lot about what traders are thinking and how they are positioned. This will be interesting! Tuesday’s 1.3% gain in the S&P500 was one of the best looking day’s we’ve had in a while. We closed at the highest levels in weeks as fear of a bigger selloff continues to dissipate. But there are a lot of flaws in this strength. Volume was light as few people traded ahead of the Fed’s rate hike decision due later this week. This reduced volume leaves the market vulnerable to larger moves because smaller traders have greater influence. Another concern is Tuesday’s intraday trade was fairly one-direction, suggesting more of a short-squeeze than legitimately fought for and earned gains. This notion is s further reinforced by the lack of a fundamental or headline catalyst behind this move. It felt like a day where people were buying for no other reason than other people were buying. While a legitimate reason can emerge to justify this move, without something substantial to support us, this strength will likely fizzle. And lastly we are approaching the upper end of a recent trading range that we retreated from a couple of times previously. In range bound markets, relief often gives way to fretting. Until we breakout and hold those gains, we should be more inclined to take profits at these levels than continue chasing prices higher. It is hard to avoid the rate hike chatter. Will they? Won’t they? If our economy is so fragile that its fate rests on the outcome of a 0.25% change in short-term interest rates, then we have far bigger things to worry about. Personally I think the Fed should raise rates because that is consistent with all the things they’ve been telling us. Markets are far better at dealing with bad news than uncertainty. A 0.25% rate hike now or in six or twelve weeks isn’t going to make much of a difference to anything. But the market is paralyzed by now knowing what is going to happen. Postponing the rate hike will only extend this largely unproductive debate over when the first hike will be. We saw the same anxiety and fear ahead of Taper, but once the Fed announced Taper and started reducing its bond purchases, the market embraced that certainty and predictability, paradoxically rallying throughout the entire taper process. I have little doubt the same will happen if the Fed lays out a responsible and methodical rate hike plan. That eliminates the uncertainty hanging over us and finally lets the market focus on our steadily improving economy. In the near-term, I have absolutely no idea how the market will react to either a hike or delay. Give me the Fed statement early and I wouldn’t know how to trade it. Only after the fact will we be able to come up with the “official” explanation for why the market rallied on a hike/delay or plunged on the hike/delay. While we cannot get ahead of the Fed announcement, the way the market trades afterward will go a long way to telling us its mood and where it wants to go next. Will it embrace the half-full story, or obsess over the half-empty? The ideal bullish setup will be a knee-jerk selloff on a rate hike, but then the selling quickly exhausts itself and we break through 2,000 resistance. That would be the capitulation bottom of the correction. This reversal could play out over hours or weeks, but it would be a strong sign the market will rally into year-end. The harder price action to get behind will be a pop if the Fed keeps rate at zero. That is far more likely to fail since what the Fed is really telling us is they don’t think our economy is strong enough to handle a 0.25% bump in interest rates. Surely not a ringing endorsement of our economy. What’s a good trade worth to you? How about avoiding a loss? For less than the cost of a daily coffee, have analysis like this delivered to your inbox every day during market hours. 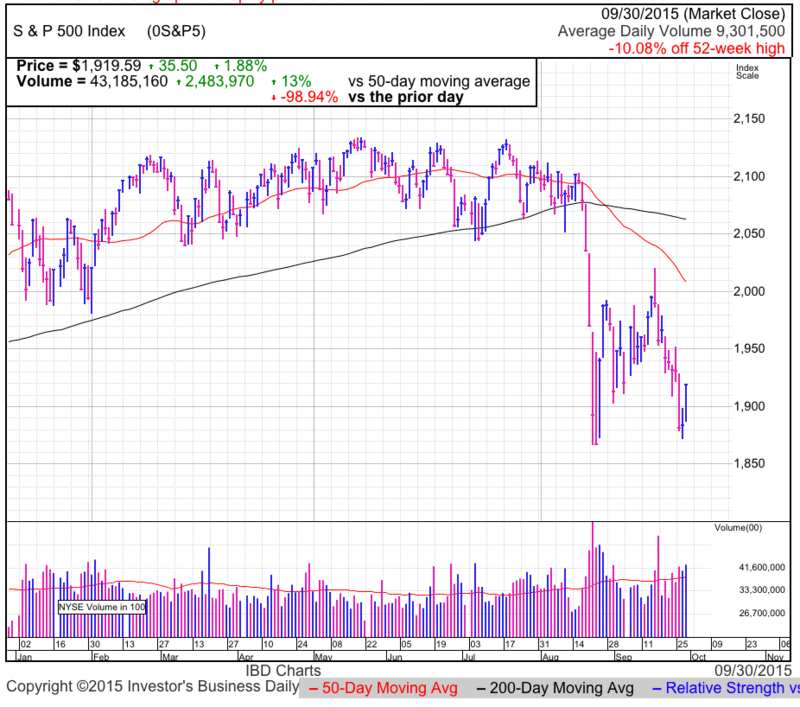 The S&P500 exploded higher today, one trading session after plunging lower last Friday. This followed two huge up-days, which was proceeded by a gigantic plunge, that was on the heels of an epic multi-day rally. And so on, and so forth, you get the idea. It’s been a volatile few weeks as we consolidate the recent selloff and build a base between 5% and 10% under recent highs. While these moves have been dramatic and emotional, the non-stop plunge has yet to resume, a good sign prices are stabilizing in the 1,900s. This volatility has been driven by economic uncertainty in China and the Fed’s looming rate hike. But while it doesn’t feel like it, down nearly 10% makes this one of the safest times to own stock all year. Risk is a factor of heights and this is the lowest we’ve been in quite some time. Common sense tells us the lower we go, the closer we are to the eventual bottom. Rather than fear this market, we should embrace it. While there is still the potential for further downside, no matter how much lower we go, the downside will still be less than the fall experienced by those that bought a couple of months ago. Take advantage of this new-found safety due to lower prices, don’t run from it. China continues to dominate traders’ thoughts and is the source of most of the market’s anxiety. I have little doubt the situation in China will continue to deteriorate over coming months, but it will matter less and less as the market grow accustomed to the situation and it becomes priced in. Very few US companies rely on the Chinese consumer as a major source for their corporate profits. That’s why a weak Chinese economy will have a limited impact on S&P500 earnings. In fact, since we are an import driven economy, we will actually see a net benefit as companies input costs fall due to weaker Asian currencies. The knee-jerk reaction was to fear a Chinese slowdown, but it won’t take long before traders realize the actual situation is nowhere near as bad as feared. As for the near-term trade, we are forming a trading range between 1,900 and 2,000. One day’s euphoria gives way to the next day’s stampede for the exits. Closing near 1,970 leaves us near the upper quarter of this range, making us more vulnerable to another overnight hand grenade out of China. This a better level to be locking in profits than chasing the bounce. 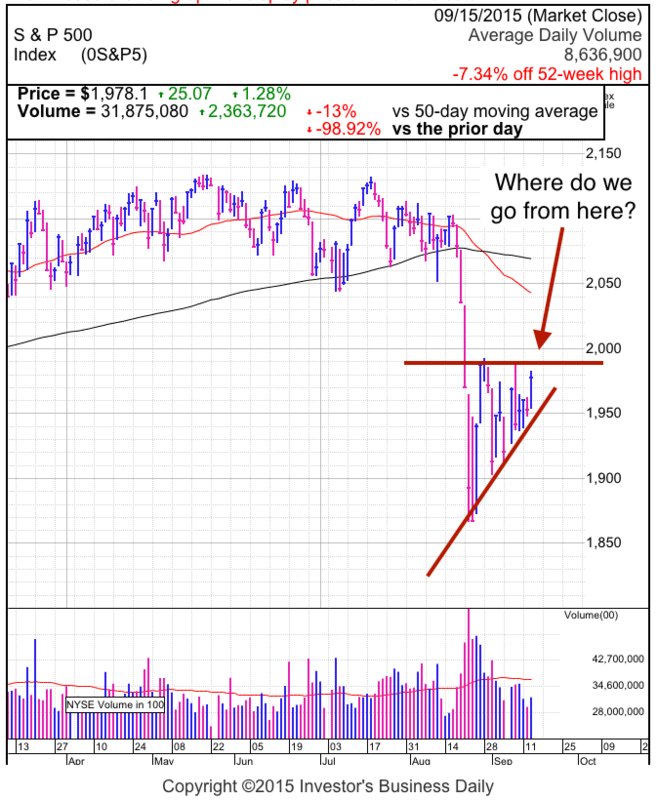 The safest way to trade this market remains to be either ride out the waves by sticking to a buy-and-hold plan, or stay on the sidelines until there is a little more price stability. The choppiness will likely last for another week or two as the Chinese situation gets priced in and we wait for clarity on our Fed’s rate hike intentions.